One of the highlights of Punakha is visiting the Punakha Dzong, which straddles the confluence of the Mother (Mo Chu) and Father (Pho Chu) rivers like an ancient ship stranded by the tide. 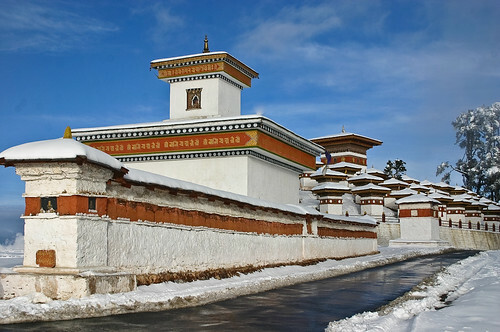 The dzong’s first courtyard functions as the administrative headquarters for the Punakha district and contains 21 temples within its third courtyard, the largest of which is the monks’ hundred-pillared Great Assembly Hall. Beyond the pre-eminence of the dzong, the Chimi Lhakhang built late in the 15th century is a must see to take in the history of this auspicious worship house and its ritual phalluses. A beautiful hike takes one to the regal Khamsum Yuelley Namgyel Chorten which dominates the upper Punakha Valley with views across the Mo Chu and up towards the mountainous peaks of Gasa and beyond. High above the Punakha Valley also lies the secret village of Talo, the birthplace of the Zhabdrung who unified Bhutan and built many of the Kingdom’s existing dzongs. One of the highlights of Punakha is visiting the Punakha Dzong, which straddles the confluence of the Mother (Mo Chu) and Father (Pho Chu) rivers like an ancient ship stranded by the tide. The road to Punakha from Thimphu winds and climbs through pine forests and passes streams, waterfalls, chortens and prayer flags, rising to Dochu La Pass, with its wonderful vistas, at an elevation of about 3,000 metres. Dochu La is 1 hour from Thimphu. On a clear day, you can see most of the high snow-covered peaks of the Bhutanese Himalayas. Be sure to walk around the 108 chortens (clockwise of course). These 108 chortens are dedicated to His Majesty The Fourth King, specially for leading the Bhutanese army to fight Indian armed militants in the jungles of southern Bhutan, in 2003. Punakha is 90 minutes from Dochu La. Dochu La Pass is at an elevation of about 3,000 m.
Punakha has the only dedicated mountain biking trail in Bhutan. 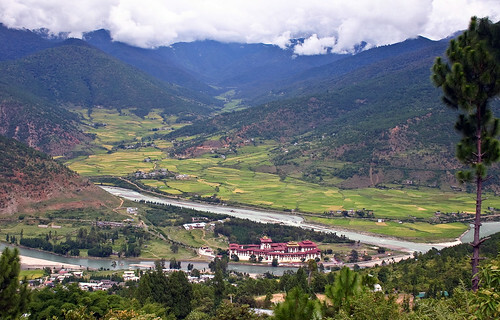 In fact Punakha has 2 mountain biking trails – both behind the Punakha Dzong. One is along the Pho Chu, while the other trail starts from the Pho Chu, and climbs up to Tshochasa School. 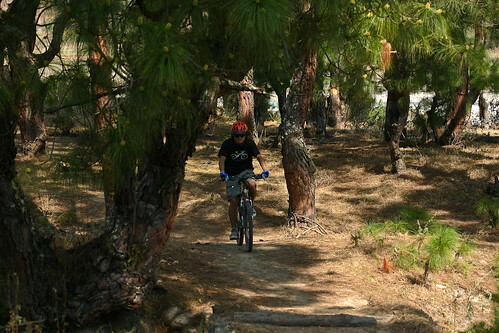 Punakha has excellent mountain biking trails.